This dish is very versatile. It can be enjoyed either hot or cold. Perfect in spring and summer, waiting for the arrival of autumn. 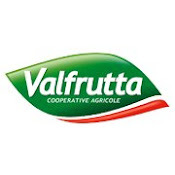 These delicious vegetables rich in butterflies colorful, vaguely reminiscent of the delicious Sicilian caponata, is a very simple dish, tasty, but above all, they will not leave indifferent even the palates of your children. 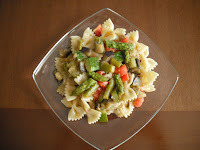 A delicious way to enjoy pasta, so delicious vegetables. In a saucepan, bring water to boil for the pasta. Meanwhile, remove the peel carrots, asparagus, and the final part of the stem (if it is frozen asparagus, probably, they will already be clean.) Chop the carrot into small cubes. Chop the onion and fry in a pan with a drizzle of extra virgin olive oil for one minute. Remove from heat. Cut the eggplant into 2 segments and remove the core with seeds. After yet cut the eggplant into cubes. Put the pan on the heat and add the vegetables to the chopped onion. Cut the zucchini into small cubes, and add to the rest of the vegetables. Season with salt and pepper. Sprinkle with the vegetable broth. Allow to cook until the vegetables are cooked. Cook in boiling butterflies. Drain the butterflies when they are al dente and pass them quickly under running cold water to cool quickly and stop the cooking. Cut the tomatoes into cubes, removing the first, the seeds in the middle. Add the rest of the cooked vegetables when they are warm. 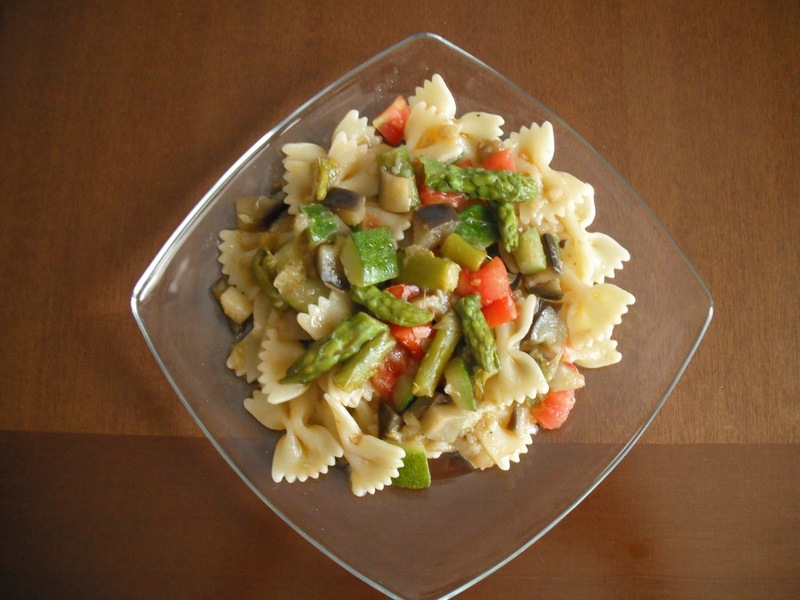 If you want this dish to be served cold, mix the pasta with the vegetables and let stand for 20 minutes before serving. If you prefer the warm plate, place the pan with the vegetables on the fire. Add the pasta, and jump over a high heat for a minute.